Kellogg's may have used more breakfast characters through its history than any other cereal company. To permit faster loading, our Kellogg's Cereal guide is divided into multiple pages. You will find a link to the second page at the bottom of this page. Thank you, and enjoy! These three little gnomes were the first and longest-lasting characters to represent a Kellogg's product. Artist Vernon Grant drew the early gnomes. They were also the first animated characters to ever appear in a cereal commercial. "Wake up on the Rice side". Snap! was born in 1933. Snap! is the oldest and is a good-natured leader. He wears a baker's hat. Pop! (1941) is a comedian. He wears an old-style military hat. Crackle! (1941), somewhat of a know-it-all, gets caught in the middle, trying to keep order between the other two. Crackle! wears a red-striped stocking cap. It is rumored that a 4th, short-lived, character named "Pow" was introduced in the mid-1950's. See the concept art for Pow. In 1949 Snap! Crackle! and Pop! magically changed from gnomes with huge noses and ears to more human-looking creatures with more proportional features. They continue to evolve. As fashions change, so do their costumes. Their hair also grows long or is cut shorter at times. 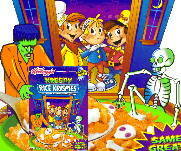 A Frankenstein monster and a skeleton appeared with Snap, a frightened Crackle, and Pop in this special 2001 Halloween box of Kreepy Rice Krispies. 3-D images of Snap, Crackle and Pop began appearing on some Rice Krispies cereal boxes in 2001. Born in 1951 or 1952, Tony the Tiger, Katy the Kangaroo, Elmo the Elephant, and Newt the Gnu all represented Kellogg's Sugar Frosted Flakes when the cereal was first introduced. Only Tony and Katy ever made it to a cereal box. However, Tony proved the most popular, and the other three were dropped after only a year. Dallas McKennon provided the original voice of Tony. Thurl Ravenscroft, who passed away on May 22, 2005, had provided the voice for so long it was his voice with which everyone is most familiar. Old Tony (shown above right) appeared from 1951 to 1955. His son, Tony Jr., became the trademark of Kellogg's Frosted Rice cereal. For a while in the 1970's, Tony had an entire family, including a son, wife, and a daughter, Antoinette. Frosted Flakes are "those big crisp flakes of corn with that secret toasted in sugar frosting". We understand that Tony the Tiger was called "Tom-Tom the Tiger" in the island nation of Greneda. Banana Frosted Flakes were natural banana-flavored sugar frosted flakes of corn with real banana bits. These short-lived clever-idea flakes (1981-1984) apparently had little appeal. Katy the Kangaroo (early 1950's) made an appearance on boxes of Frosted Flakes, but lost the permanent postion to Tony the Tiger (see story above). George Reeves appears as Clark Kent in an early 1950's TV commercial featuring Katy the Kangaroo on a box of Frosted Flakes. Tony Jr. (1952) is the son of Tony the Tiger. In 1982 Frosted Rice was renamed Frosted Krispies. Mrs. Tony (1971) is the wife of Tony the Tiger. Mother Tony is of course the mother of Tony the Tiger. Shown is a drawing before it made it to a cel. Antoinette (1974) is the daughter of Tony the Tiger. Patrice Jennings voiced Antoinette. "I did two spots. One was set in a hospital, Tony was holding me (Antoinette, as a brand new baby) and a box of Frosted flakes and I reach into the box and eat a handful and say 'They're Great'. The other was set at the breakfast table, Antoinette (aged 1 - 2) was in a highchair and Tony Jr. was sitting at the table as well." Various Ringling Bros and Barnum Bailey clowns appeared on boxes of Sugar Smacks, a sugar-toasted wheat puff, from 1953 to 1956. Cliffy the Clown (shown bove) had the show to himself in 1955. Lou Jacobs and Paul Jung appeared in 1953. Charlie Bell appeared in 1956. Born in 1957, an animated seal in a sailor suit named Smaxey "makes breakfast the happiest meal of the day.". He appeared on boxes until 1959. By 1961, Quick Draw McGraw (the cartoon sheriff) took over as spokescharacter. "Now, hold on thar'!" Quick Draw McGraw is a horse. His side-kick, Baba Looie, is a burro. "And d-o-o-o-o-o-n't you forget it!" In 1965, The Smackin' Bandit (not shown), a half kangaroo / half mule with big, wet lips spent his time trying to kiss everybody. In 1966, The Smackin' Brothers, two youngsters wearing boxing gloves and trunks appeared. "Sugar Smacks. Honey on the outside, Sugar on the inside, Puffed up wheat, smackin' sweet, a taste that knocks you off of your feet". "With the famous one, two, punch --- honey and sugar". One brother wanted a smack, so the other would hit him. There was another, very short-lived character on the Kellogg's Sugar Smacks box during the early 1970's: a nameless, flesh and blood Indian Chief who appeared in the commercials while an announcer extolled the virtues of how Sugar Smacks gives him the stamina and energy to go hunting or trailblazing...or something like that. The Indian did not last long. In 1972, Dig'Em Frog was released. Dig'Em is a cool 10-inch high green frog in a baseball cap. In 1983 the name of the cereal was changed to Kellogg's Honey Smacks, and Dig'Em hopped around until 1986, when Wally the Bear replaced Dig'Em. Kellogg's thought Wally the Bear would more appropriately represent a cereal with the taste of honey. But Dig'Em had such a fan club that he returned in 1987 to stay. Dig'Em used to play chase with a cat named Kitty, and of course Dig'Em always won while Kitty usually got herself knocked senseless. Dig'em was known as "Charly" in Switzerland back around 1976. Wally the Bear admiring a box of Honey Smacks, the "honey sweetened puffs of wheat" cereal. Born in 1958. Jose was a little monkey, wearing a bandanna and cabana boy-type straw hat. Coco, a wide-eyed elephant wearing a straw hat, replaced Jose in 1960 and rode boxes for two years. Snagglepuss the Lion (a Hanna-Barbera cartoon) represented Cocoa Krispies between 1962 and 1966. Snagglepuss wasvoiced by Daws Butler. A stocky little caveman named Ogg represented the cereal from 1967 to 1970. In commercials he was joined by his wife, Kell (Kell-Ogg, get it? ), Marty and a cow named Charlie. Tusk the Elephant was born in 1971, and lived ten years. Tusk was more scholarly and wore glasses. "Kellogg's Cocoa Krispies... They are so chocolate-y, That when I get a taste of them, I trumpet happily. Toot toot toot too!" Even Tusk was replaced in 1981 by Snap! Crackle! and Pop! The trio appeared on all the Kellogg's Rice Krispies variations. Melvin the Elephant, a happy little fella with a spoon in his trunk, represents the brand in Argentina, Brazil, Chile, Guatemala, Mexico, Paraguay, Peru, and Venezuela. A new Coco (this time a monkey) represents most of the rest of the world. He was born in England in 1986. Swinging and singing through his jungle home, he protects his favorite cereal from tricky animated animals who want to take it away. Coco's friends include Shortie (a real smart giraffe), Alan (the humorous aardvark), Osmelda (a female ostrich), Heftie (a large hippo), Kylie (a kangaroo). In October 2001, Snap! Crackle! and Pop! once again reigned supreme on the "chocolately, sweetened rice cereal". They replaced Coco the Monkey on boxes of Kellogg's Cocoa Krispies rechristened as Kellogg's Cocoa Rice Krispies. "Cocoa Krispies. Tastes like a chocolate milkshake --- only crunchy". Disclaimer: This is a non-commercial site with the sole purpose of assisting visitors in locating information on their favorite breakfast cereal characters. Snagglepuss is a trademark of Turner Broadcasting. All of the names, characters, brands, and icons listed here are trademarks of Kellogg's or their respective parent companies and cannot be used for commercial purposes. Enjoy Kellogg's cereals and support your favorite characters!